Hi girls! How are you today? Yay for weekend, right? Any plans? The polish I am showing you today is one of the new Essence colors. It is also the only green color in the current range. I am not quite sure why there is just 1 green in the large ranges they have available. I mean, you can do lots of pretty things with green, right? This polish is very pretty and I am glad I bought this one. It applies super easy in 2 coats, and the shimmer or glass flecks in it are so stunning! 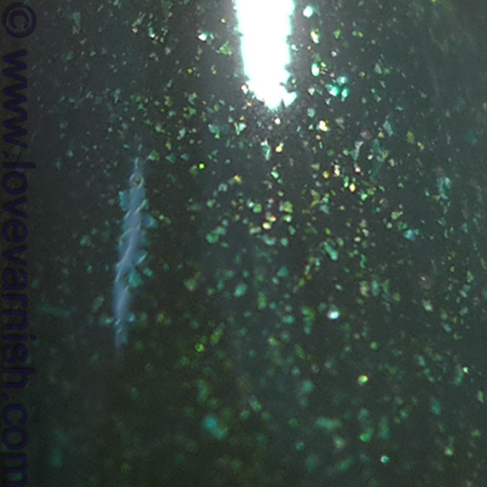 The base is a murkier darker green while the glass flecks seem to be a lighter green/gold color. Perfect! Are you disappointed with only one green? And what is your favorite color? It looks great on you! I picked this one up along with 2 others from the new Essence range, but I haven't tried it yet. I love the new shades, I just wish they had more greens in their standard range. I think I've got this one too. So lovely! I DID get this color, lol! I can't wait to wear it, it looks gorgeous! I love the shimmers in this! That really is super-pretty! Thanks for the great swatch! Yes the lack of greens is really a disappointment. Hopefully they'll add more in Spring! Bet this looks good on you too :). Thanks Kelly, the flecks are so special! Oooh yes, Glittering Garland... *writes comparison on to do list*. Lazy time <3. You do, you do ♥. Oooh yes wear it wear it wear it now! Well there is a chance you did by now, 22 days after your comment ;). Thanks lovely Katy! I hope there will be more green added in the Sprint switch :).